We have been watching the weather in Alabama today and are so thankful that so far we have not seen reports of damage or injury from the storms in Blount County. Everybody be careful. This morning was COLD! It was really only 44 but with the 15-20 mph winds it seemed so much colder than yesterday. The predicted low tonight is 31 so it will be another cold start tomorrow. This is actually more the type of weather we were expecting when we came to Elmore City in February. We brought lots of cold weather clothes but have sure enjoyed the spring like weather. Hopefully it won’t be quite so windy tomorrow. 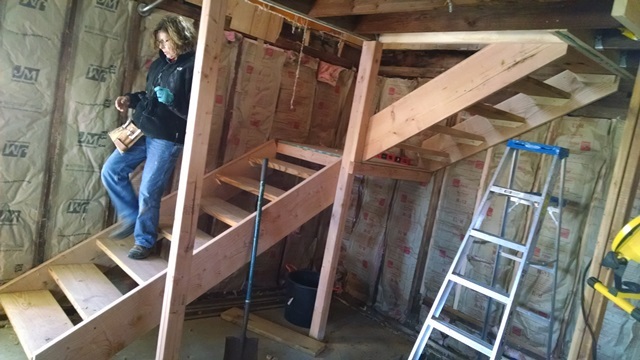 Today the stair team completed the stairs with the exception of the handrail and they are working on that. The stairs look wonderful. 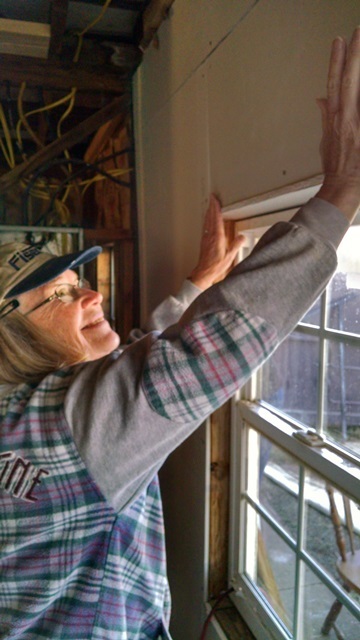 We built them with wider treads and shorter risers so that they would be easier and hopefully safer for our homeowner. Hopefully the handrails will be completed tomorrow because the homeowner came over this afternoon and we couldn’t talk him out of going upstairs without a handrail. We also continued to install the drywall. 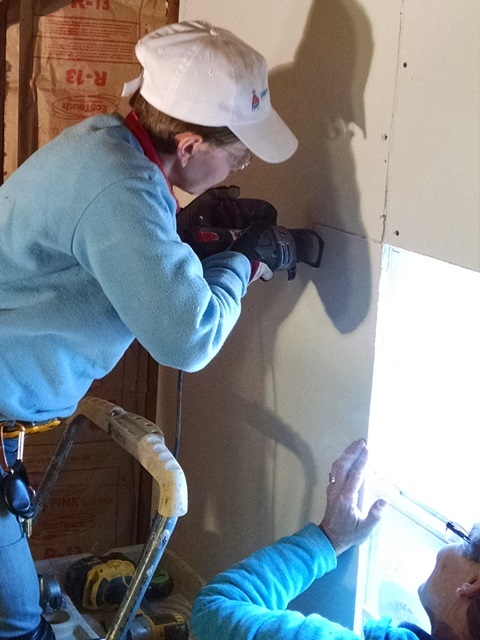 The Drywall (formerly Demolition) Divas are getting pretty good at measuring, cutting and installing the drywall. We were excited that Henry was going to be able to do more work on the plumbing today but the VIM folks said that the Home Depot didn’t have all the needed supplies so there was some plumbing done, but Henry moved on to electrical. He had to install some outlets before the drywall was installed. The VIM guys were going to Oklahoma City for a meeting today and hope they can get the things necessary to complete the plumbing. Gary continued to work hard on the exterior of the house. Today is Ash Wednesday, the beginning of the season of Lent, so tonight we went to Elmore City UMC for their Ash Wednesday Service. Pastor Caroline had a very good service with the placing of the ashes on our foreheads. 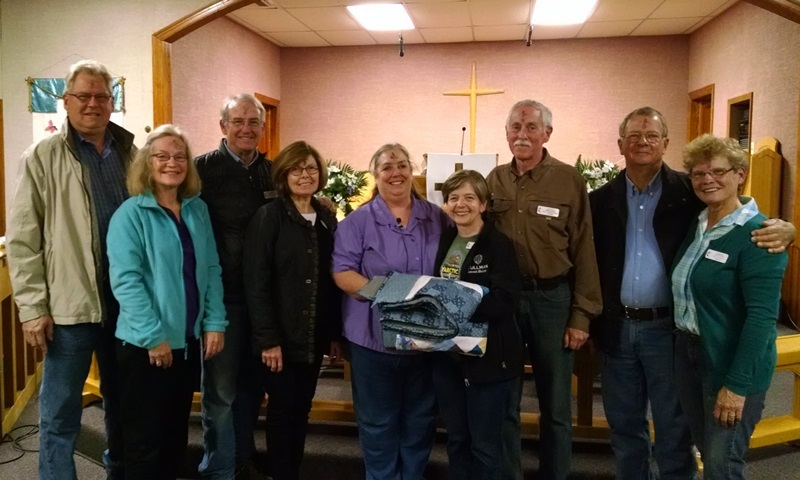 At the end of the service, since tomorrow is our last day here, Pastor presented us with a beautiful quilt made by the Peacemakers, the quilting group at the church. It is so pretty and we appreciate it so much. The church has been so nice to us and so welcoming. Hopefully we can stay in touch with them as we have some of the other churches we have visited in our travels. 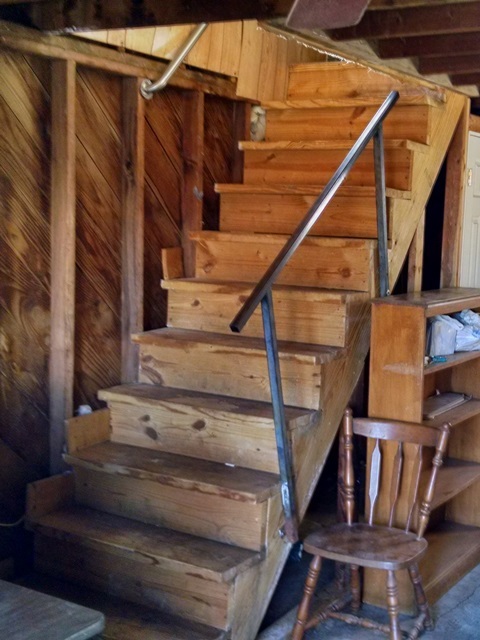 Author rvingwithapurposePosted on March 1, 2017 March 2, 2017 Leave a comment on Stairs Complete!